Tasmania Film Photography's Blog | Film photography in Tasmania; Classic Camera Collecting; and Adventures in Camera Repair. 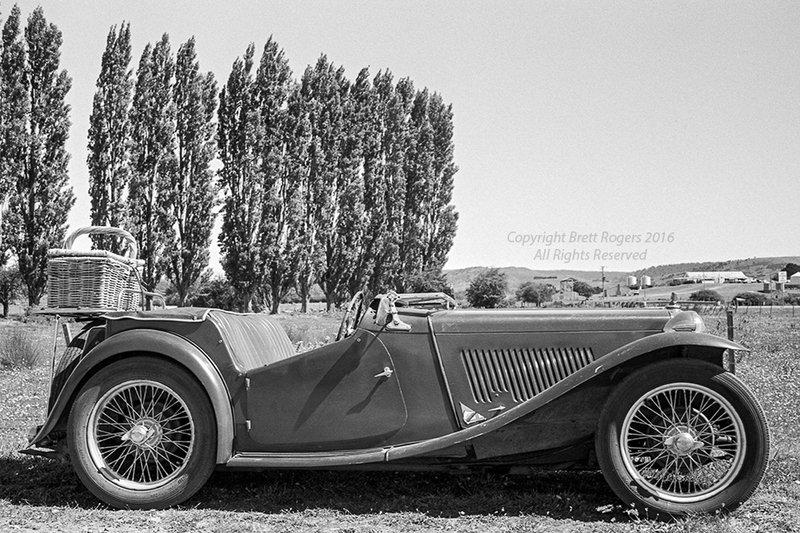 Film photography in Tasmania; Classic Camera Collecting; and Adventures in Camera Repair. I’m a member of the Film Shooters Collective, an international group of photographers who image with film. At the behest of its founder and guiding force, Cameron Kline, I recently penned a series of articles about getting started in camera repair. The series is in four parts: you will find them via the following links. On Thursday 18th February 2016 I was privileged to return to Government House Tasmania at Queens Domain, Hobart—this time, as a member of a small tour group. I’d been previously advised that on the day, photography was not only permitted, it was encouraged. I thought this was a splendid prospect. Whether Government House staff anticipated the likes of myself would arriving armed with 2 x Minolta SRT101 35mm SLRs, a Hasselblad 500C/M medium format SLR, and a 2.8 Rolleiflex TLR, might be “dubious”. 😉 But as there were no stipulations as to precisely how much photography could be undertaken I decided to come (over?) prepared, with the hope of doing a reasonable enough job of making some decent images to do a photo essay of the experience. Readers will have to judge the success of this for themselves, of course—but here are the results as the majority of images below, were, indeed, made on that day. I have also included a few made by me during previous visits to Government House. Government House Tasmania, Queens Domain, Hobart. Image Details: Circa 1955 Rolleiflex 2.8C twin lens reflex (Schneider 80mm f/2.8 Xenotar taking lens); Fujifilm Neopan Acros 100 black & white negative film (developed in ILFORD ID-11 1 + 3 dilution @ 20C/16 minutes). 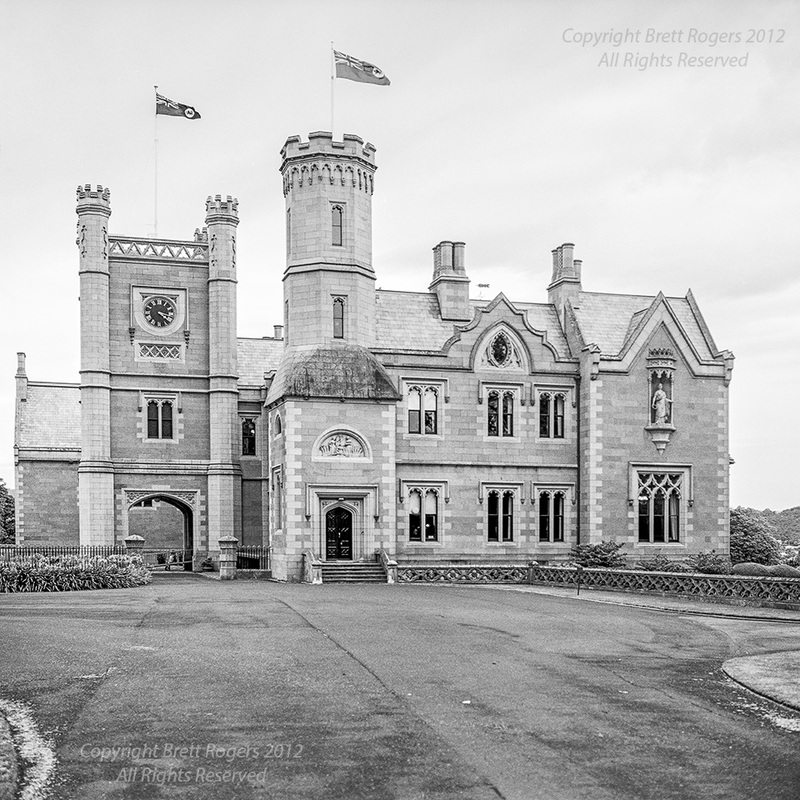 As a frequent visitor to the Royal Tasmanian Botanical Gardens adjoining Government House, Tasmania’s Vice-Regal residence had long interested me from afar, both as a photographer and as someone who has an active interest in local history. But it remained tantalizingly out of reach until I eventually visited it for the first time about six years ago, during one of the Governor’s public open days. It exceeded my expectations in every way, and ever since I’ve taken advantage of any opportunity I can get to return. Externally, the House is a fine example of 19th Century stone masonry on a commanding scale. Its setting adjacent the River Derwent around ¾ mile from Hobart’s centre is spectacular, as is its extensive garden. Pond, Government House Tasmania. Image Details: 1971 Zeiss Ikon Contaflex S 35mm SLR (Carl Zeiss 85mm f/4 Pro Tessar lens); Kodak Tri-X ISO 400 35mm black & white negative film (developed in ILFORD ID-11 @ 1 + 3 dilution @ 20C/20 minutes). Subjects for photography are positively abundant. The garden pond by the main drive (seen in the above image) was formed from the quarrying of stone used in the construction of Government House. The pictured dinghy was hand crafted out of Celery Top, a native species of Tasmanian timber. But today, the House is still the principal residence of Tasmania’s serving Governor and his or her family, and most parts of it remain strictly off-limits to the general public, even on public open days which take place once a year or so. I therefore determined to make the most I could of this rare opportunity to discover the secrets of those parts of the House hitherto out-of-bounds to most of us. In the first image, you will see an archway beneath the clock tower. This forms the main entrance portico off the turning circle, in the centre of which is an ornamental fountain. As you enter the turning circle, you pass a beautiful trio of native birds set in bronze to your left. I always assumed the sculptures were of Tasmania’s unique, (and, most regrettably, extinct), species of emu, but I’ve since been advised by the Head Gardener, Mr Steve Percival, that they are actually brolgas, not a species endemic to Tasmania—which makes them a curious choice of ornament—but no less photogenic for all that, to my thoughts. 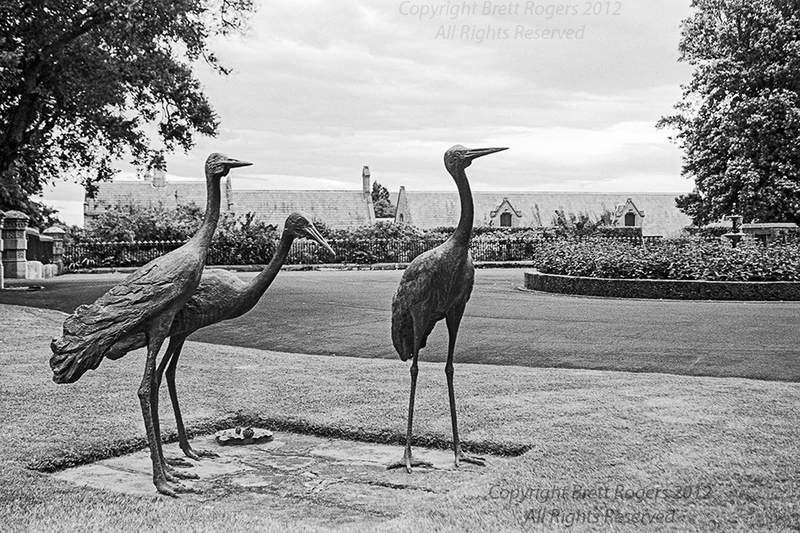 Brolgas, Government House Tasmania forecourt. 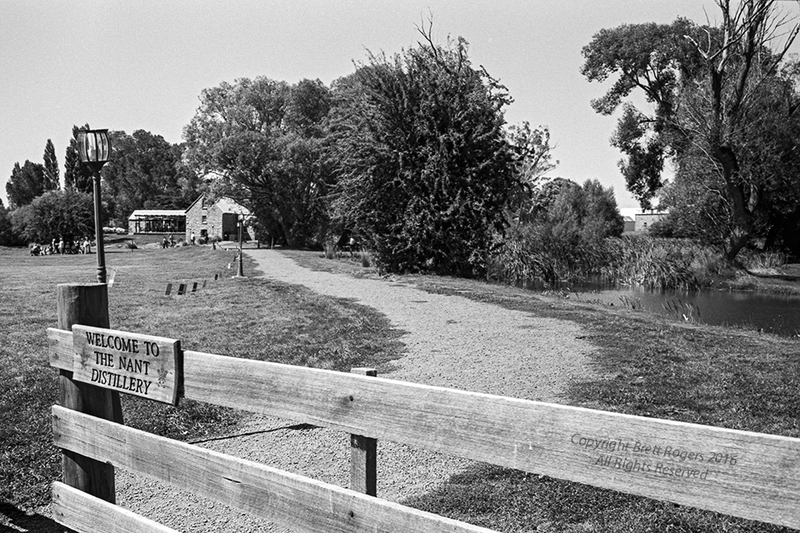 Image Details: Zeiss Ikon Contaflex S (Carl Zeiss 50mm f/2.8 Tessar lens); Kodak Tri-X ISO 400 (details as above). Moving through the portico and up the steps through the main door one sees a foyer with stair case and classic furniture. On my first visit to Government House in 2010, a beautiful Steinway piano was on display in the foyer. It belonged to Mrs Frances Underwood, spouse of His Excellency the Honourable Peter Underwood AC, Governor of Tasmania 2008–2014. My camera that day was a Rolleicord Va TLR loaded with Ilford Pan F Plus ISO 50 black and white negative film. I was permitted to use a small tripod and cable release, without which the following image could not have been recorded, due to the metered exposure time of 30 seconds. 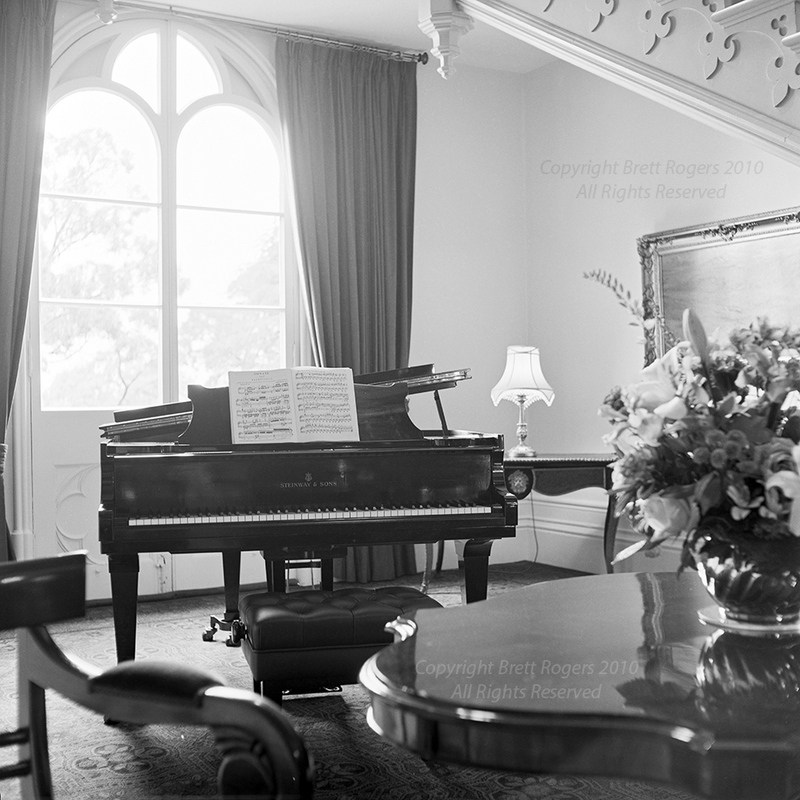 Steinway Piano, foyer, Government House, Tasmania. Image Details: Rolleicord Va twin lens reflex (Schneider Xenar 75mm f/3.5 lens); ILFORD Pan F Plus black & white negative; (developed in ILFORD ID-11 1 + 3 dilution @ 20C/15 minutes). Our tour guide on 18th February this year was Tasmania Police Inspector Glen Woolley (retired). He was ideally suited to show us through due to his extensive knowledge of the House and its history. Under his supervision, we were able to take a look through many parts of the house off-limits to most visitors. After a walk around the outside of the House we re-entered via the flower room to inspect the kitchen. As might be expected, Government House has a modern kitchen equipped to cater for various functions such as formal dinners for dozens of guests. I’d brought with me a couple of rolls of Kodak’s classic Tri-X black and white film, in 35mm—along with a pair of equally classic 35mm Minolta manual focus SLRs (their ground breaking SRT101 model) specifically for some indoor images, but I still had a few frames of ILFORD Delta 100 black and white left on one roll. With no tripod to hand, the following two images were still able to be recorded hand-held, at ISO 100, thanks to the fast 58mm f/1.4 Rokkor lenses worn by the Minoltas—although, owing to the need to set them wide open, at some expense to depth of field. 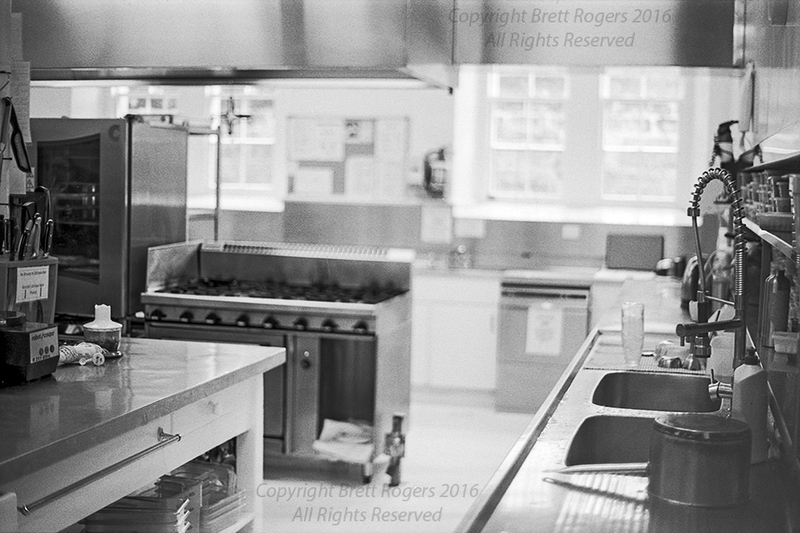 Kitchen, Government House Tasmania. Image Details: 1966 Minolta SRT-101 35mm SLR (Minolta Rokkor 58mm f/1.4 lens); ILFORD Delta 100 black & white negative (developed in ILFORD ID-11 1 + 3 dilution @ 20C/20 minutes). Hand held, available light only. Despite the presence of modern appliances, there were still a few signs of fittings originally installed for earlier Governors’ convenience. One feature I spotted was this gear drive for what may have been a 19th Century rotisserie. According to the details engraved in its face, it was supplied by: W. Jeakes, 51 Great Russell Street, Bloomsbury, London. Detail of 19th Century rotisserie in kitchen of Government House, Tasmania. 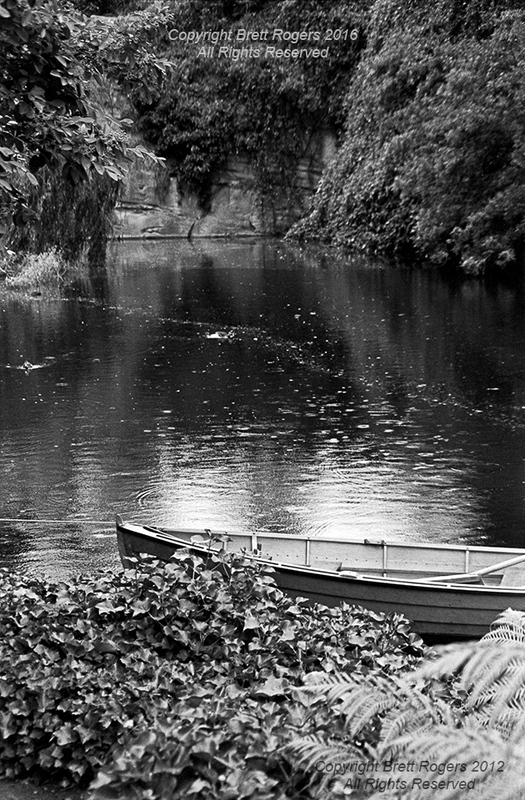 Image Details: Minolta SRT101 35mm SLR (Rokkor 58mm f/1.4 lens); ILFORD Delta 100 (details as above). From the kitchen we were able to traverse the main corridor at basement level. This was also the location of a set of remotely actuated bells connected to various rooms above, from whence the Governor and other members of the Vice-Regal household might summon the staff. Page bells, Government House Tasmania. 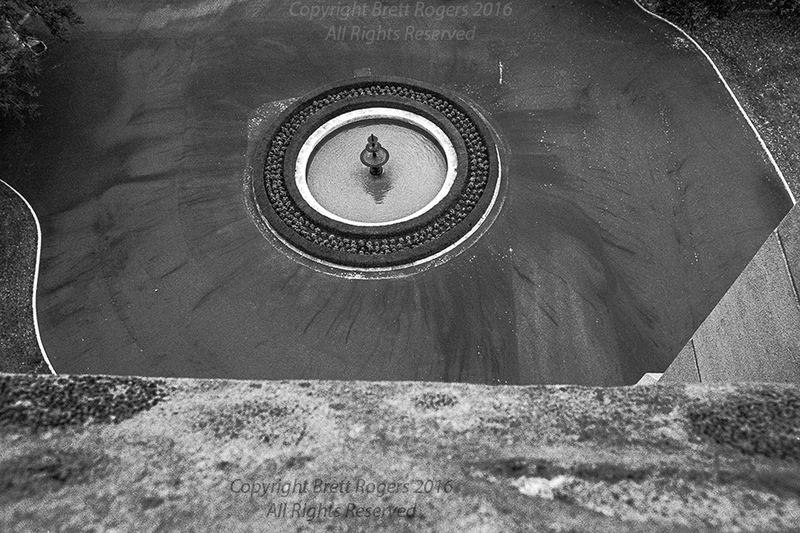 Image Details: 1966 Minolta SRT101 35mm SLR (Rokkor MC 58mm f/1.4 lens); ILFORD Delta 100 (details as above). 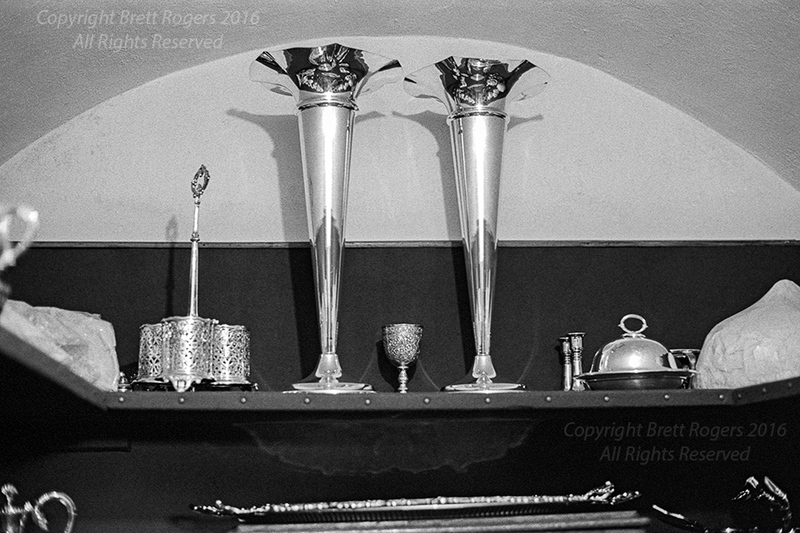 A small vault in the basement serves as a repository for the Vice-Regal silverware. Silver vault, Government House Tasmania. Image Details: 1966 Minolta SRT-101 35mm SLR (Rokkor 58mm f/1.4 lens); Kodak Tri-X ISO 400 black & white negative (exposed at EI 1600, developed in Ilford ID-11 @ 20C). Silver vault, Government House Tasmania. Image Details: 1966 Minolta SRT-101 (Rokkor 58mm f/1.4 lens); Kodak Tri-X ISO 400 at EI 1600 (details as above). 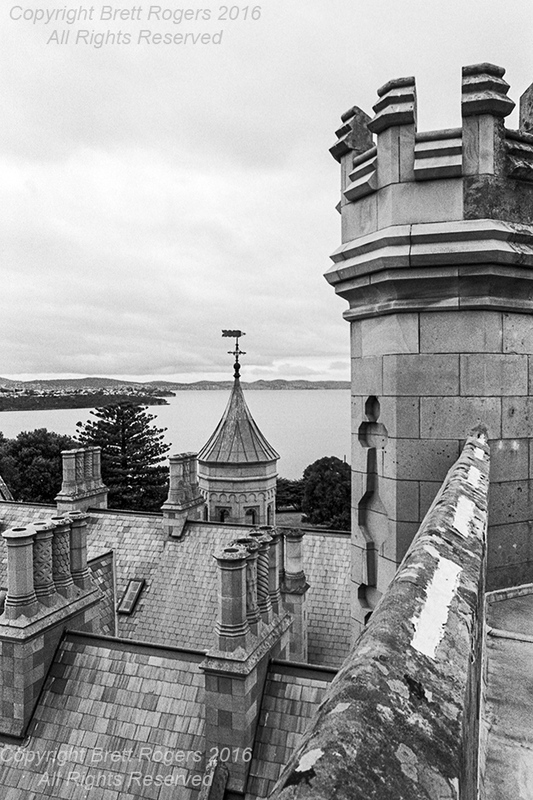 Rooftops, Government House Tasmania. Image Details: 1966 Minolta SRT101 35mm SLR (Rokkor MC 58mm f/1.4 lens); Kodak Tri-X ISO 400 at EI 1600 details as above). 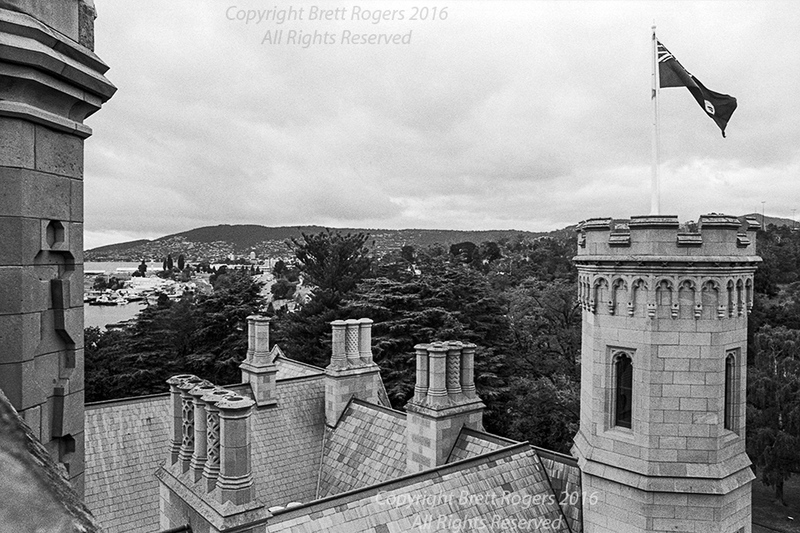 Chimney pots, Government House Tasmania. 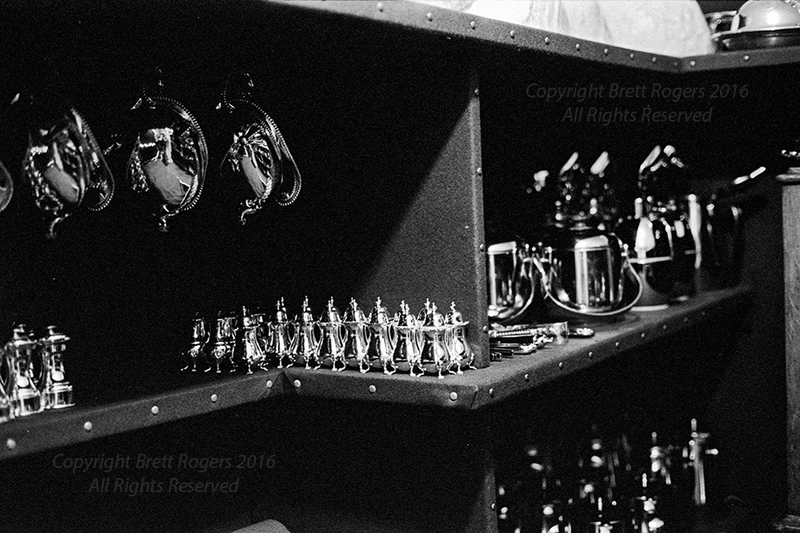 Image Details: 1966 Minolta SRT101 35mm SLR (Rokkor 58mm f/1.4 lens); Kodak Tri-X 400 at EI 1600 (details as above). After viewing the silver vault we ascended stairs through several levels. Along the way a few windows provided glimpses of acres of the beautiful slate roof and the many chimney pots, individually carved in different styles, that we’d be able to admire from atop the clock tower. To reach the top, first we had to go through the clock room containing the clock mechanism. 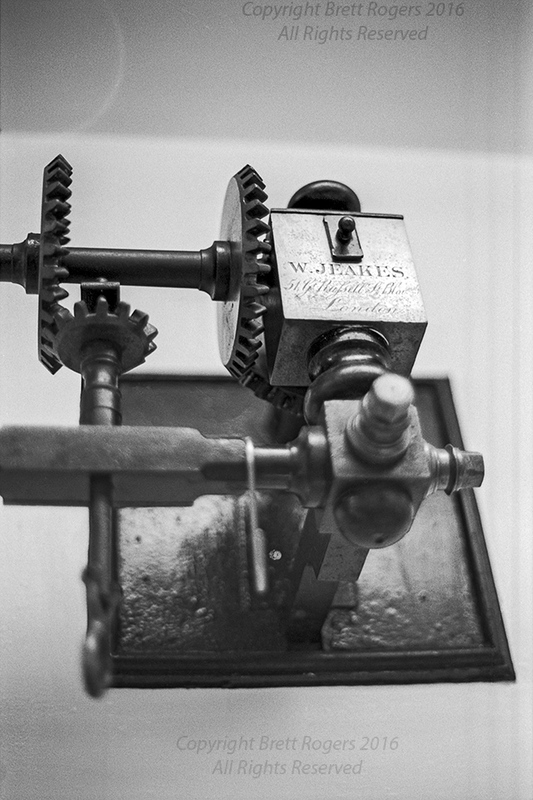 Mechanism, clock room, Government House Tasmania. Image Details: 1966 Minolta SRT101 35mm SLR (Minolta Rokkor MC 28mm f/3.5 lens); Kodak Tri-X ISO 400 exposed at EI 1600 (details as above); Camera supported on railing, fired with self timer for long exposure of approx one second. Towers provide a convenient frame for those portions of the city of Hobart not hidden beyond the trees. Even further afield you can just see Australia’s first legal casino, Wrest Point, rising from the west bank of the River Derwent at Sandy Bay. View to Hobart from clock tower, Government House Tasmania. Image Details: 1966 Minolta SRT101 35mm SLR (Rokkor MC 28mm f/3.5 lens); Kodak Tri-X ISO 400 exposed at EI 1600 (details as above). To the west the lower slopes of Mount Wellington may be seen beneath the cloud cover beyond the main driveway to the House. An unobscured view of the mountain would have been the icing on the cake so I may have to contrive another visit at some stage. 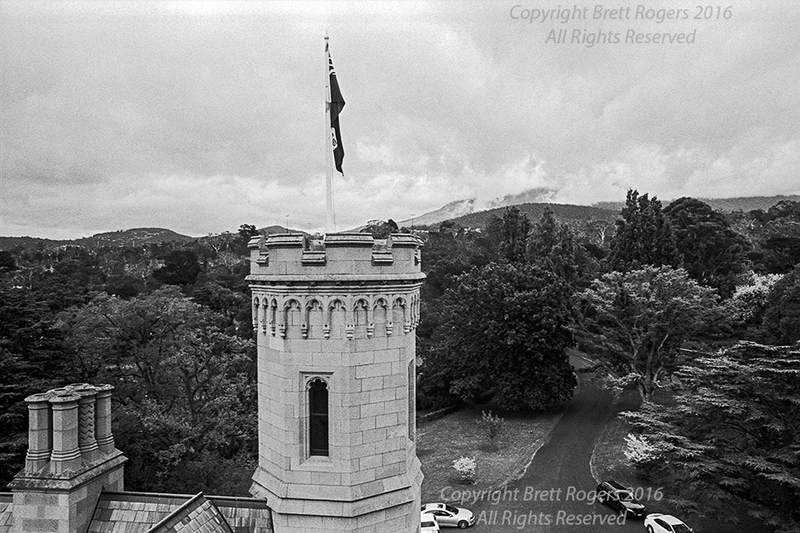 View of flag tower and Mt Wellington from clock tower, Government House Tasmania. Image Details: 1966 Minolta SRT101 35mm SLR (Rokkor MC 28mm f/3.5 lens); Kodak Tri-X ISO 400 exposed at EI 1600 (details as above). To the south the River Derwent lies beyond even more chimney pots and spires. 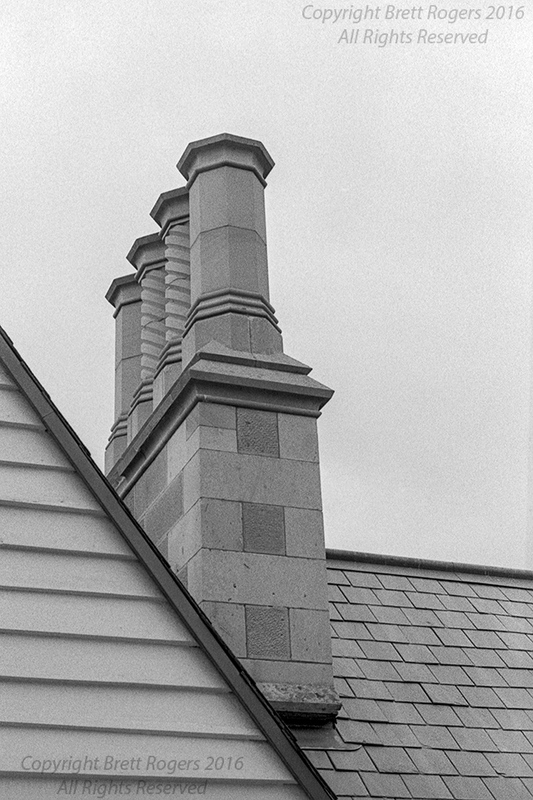 I had high hopes of the Government House rooftop being ideally suited to black and white film photography, but it exceeded all my expectations and then some. 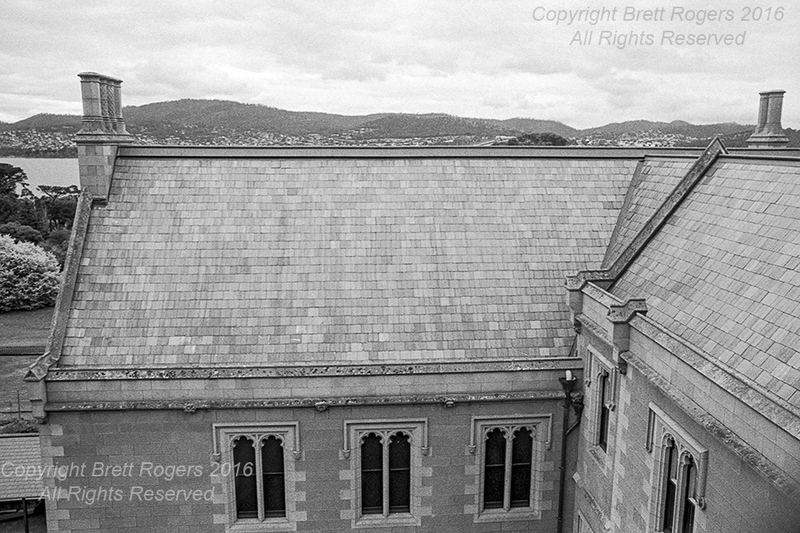 View of River Derwent from clock tower, Government House Tasmania. Image Details: 1966 Minolta SRT101 35mm SLR (Rokkor MC 28mm f/3.5 lens); Kodak Tri-X ISO 400 exposed at EI 1600 (details as above). Here’s another view of the fountain in the main entrance forecourt from an altogether different vantage point. Forecourt fountain, Government House Tasmania. Image Details: 1966 Minolta SRT101 35mm SLR (Rokkor MC 28mm f/3.5 lens); Kodak Tri-X 400 exposed at EI 1600 (details as above). Kodak Tri-X 400 @ EI 1600 @ 20C. The following image may be my favourite from the day. 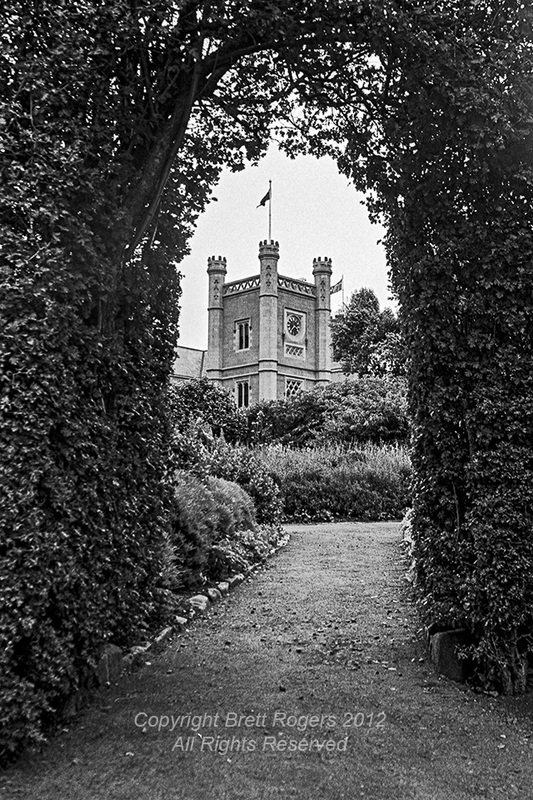 Tri-X can be a little “flat” in D-76/ID-11 at its “box speed” of ISO 400—but I love the tonality it can give when pushed a stop or two, and Government House has some of the finest views of the River Derwent in Hobart. 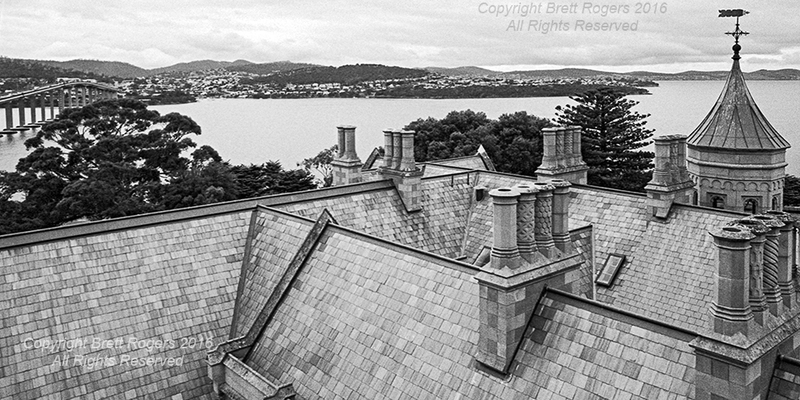 Government House Roof & View to River Derwent, Tasman Bridge, & Eastern Shore, Hobart, Tasmania. Minolta SRT101 35mm SLR. Minolta Rokkor MC 28mm f/3.5 lens. Kodak Tri-X 400 @ EI 1600 @ 20C processed in ILFORD ID-11 developer. 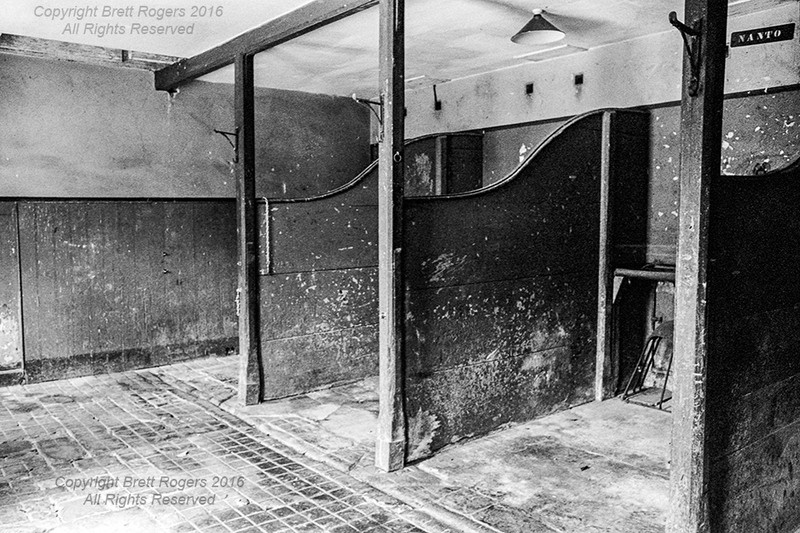 Cropped to 6 x 12 panoramic ratio from 35mm negative frame. All too soon it was time to descend the many stairs to ground level and take a look inside some of the stables. These 19th Century stone structures look to be in excellent original condition with their period slate roofs complementing those of the House. Stables, Government House Tasmania. Image Details: 1966 Minolta SRT101 35mm SLR (Rokkor MC 58mm f/1.4 lens); Kodak Tri-X 400 exposed at EI 1600 (details as above). After seeing the stables our visit concluded with a stroll though the hedge towards the House before we departed via the main gates. It seems fitting to end this article with a view back to the clock tower from which some of my favourite photographs from the day were taken. Clock tower, Government House Tasmania. Image Details: 1971 Zeiss Ikon Contaflex S 35mm SLR (Carl Zeiss Tessar 50mm f/2.8 lens); Kodak Tri-X ISO 400 film exposed at EI 400 (developed in ILFORD ID-11 at 1 + 3 dilution @ 20C/20 minutes). My thanks to Her Excellency, Professor the Honourable Kate Warner, Governor of Tasmania, her Official Secretary, Mr David Owen and the Government House staff, for their kind permission to tour the House. My thanks also to retired Tasmania Police Inspector Glen Woolley for showing me through the House and gardens. All Images and Text Copyright Brett Rogers 2010–2016. All Rights Reserved. If you’ve enjoyed these images, please like my Facebook Page or visit my Redbubble Portfolio, to see more of my work. On Saturday 5th March 2016 I made my first trip to Bothwell in some years in order to visit Nant Distillery, makers of fine Tasmanian single malt whisky. Nant is located just a few minutes drive from the centre of Bothwell. On arrival the first thing I spotted was a classic MG TC, arguably, the definitive British sports car. MG TC. Camera: Zeiss Ikon Icarex 35CS 35mm SLR. Lens: Asahi Pentax Super Takumar 35mm f/3.5. 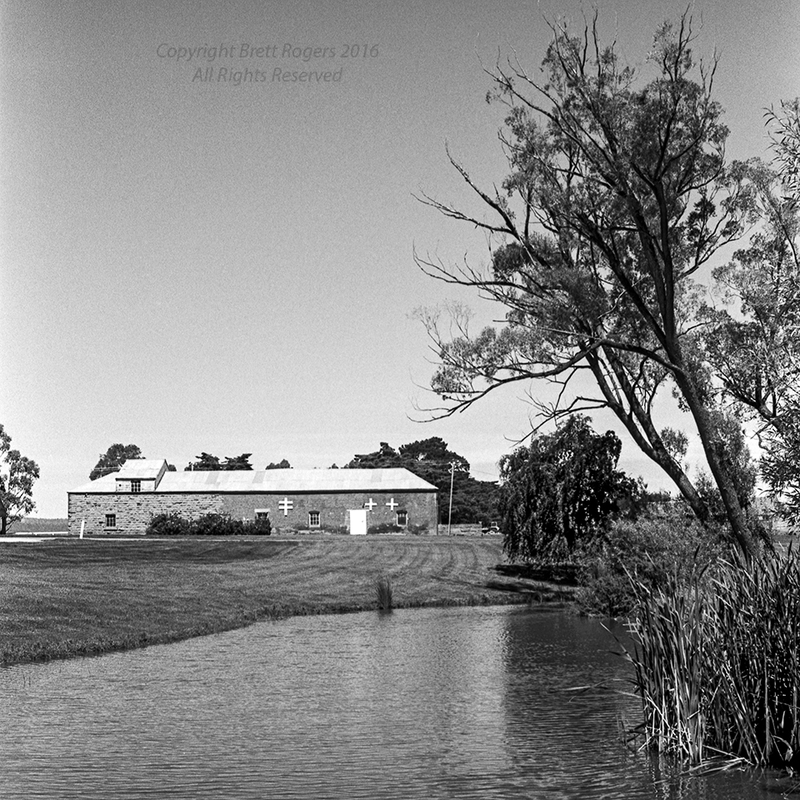 Film: Fuji Acros 100 silver halide black & white negative in ILFORD ID-11 @ 20C/16 minutes. 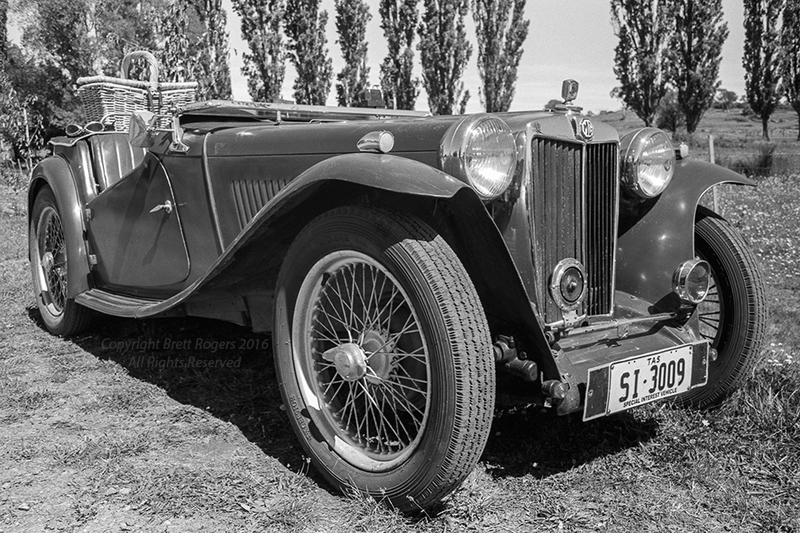 Luckily for me the current owner of the MG returned to the car as I was taking some shots of it. During our conversation he informed me that this particular TC was once owned by Australian artist Clifton Pugh. It’s in original, unrestored condition. MG TC. Camera: Zeiss Ikon Icarex 35CS. Lens: Helios 44 58mm f/2. Film: Fuji Acros 100 (details as above). 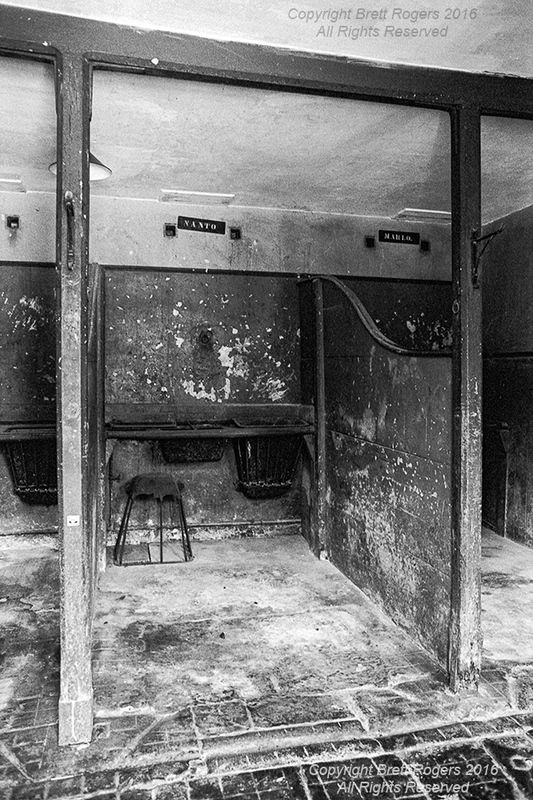 Nant is situated in what was originally a mill complex constructed from the early 19th Century. 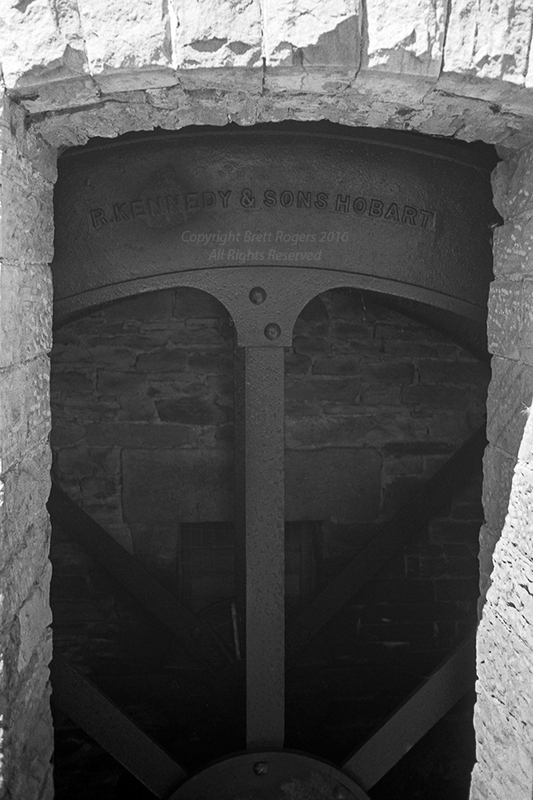 The mill building today remains in good condition and retains an original water wheel that, according to the name on its side, came from R Kennedy & Sons, Hobart. With its adjacent millpond sourcing its water from the Clyde River, idyllic is perhaps the first word that comes to mind to describe the setting in which Nant makes its whisky today. Camera: Zeiss Ikon Icarex 35CS. Lens: Helios 44 58mm f/2. Film: Fuji Acros 100 (details as above). Mill Pond, Nant Distillery. Camera: Zeiss Ikon Icarex 35CS. Lens: Helios 44 58mm f/2. Film: Fuji Acros 100 (details as above). Water wheel, Nant Distillery. Camera: Zeiss Ikon Icarex 35CS. Lens: Helios 44 58mm f/2. Film: Fuji Acros 100 (details as above). 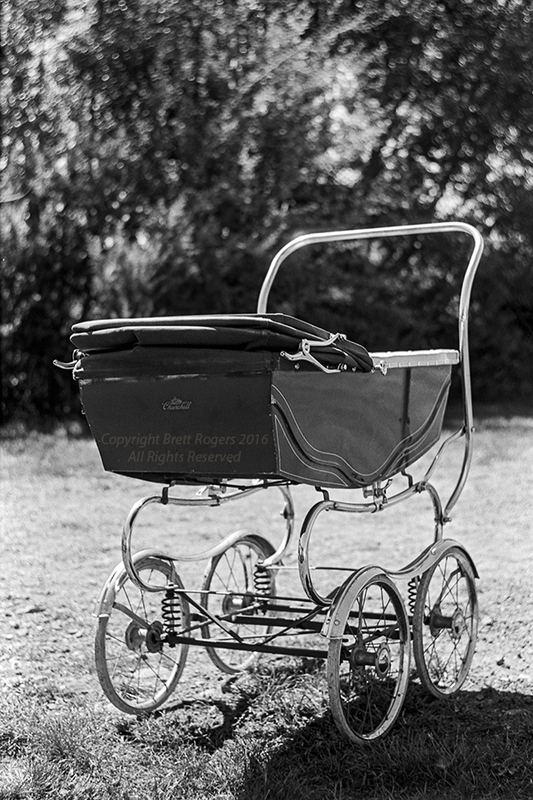 By the pond I found a vintage Churchill pram parked on the lawns unattended (it was unoccupied). I’m not sure why it was there, but it’s not something one sees every day in 2016, and seemed a good subject for black and white—so I did the obvious thing any black and white photographer would do. Churchill Pram, Nant Distillery. Camera: Zeiss Ikon Icarex 35CS . Lens: Helios 44 58mm f/2. Film: Fuji Acros 100 (details as above). Tours of the distillery and mill building are available on a daily basis. 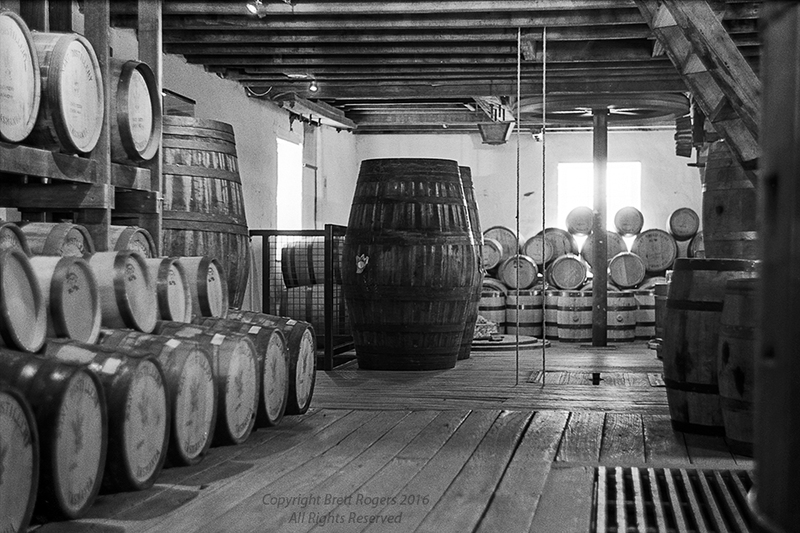 For $25.00, with tastings of several of Nant’s single malts included at the end, doing one sounded like pretty good value, as well as an opportunity to do some imaging of the mill interior. I’d planned for such a possibility on the day and had some faster black and white film than I typically use on hand—Ilford’s Delta 3200 in 120 (medium format). After taking a few meter readings inside the mill with my Minolta Auto Meter, I calculated that I’d have enough light get away with rating the Delta at Exposure Index (EI) 3200, and loaded it into my Hasselblad 500C/M medium format SLR. Our guide on the day was Grace, one of Nant’s team of friendly, helpful staff. 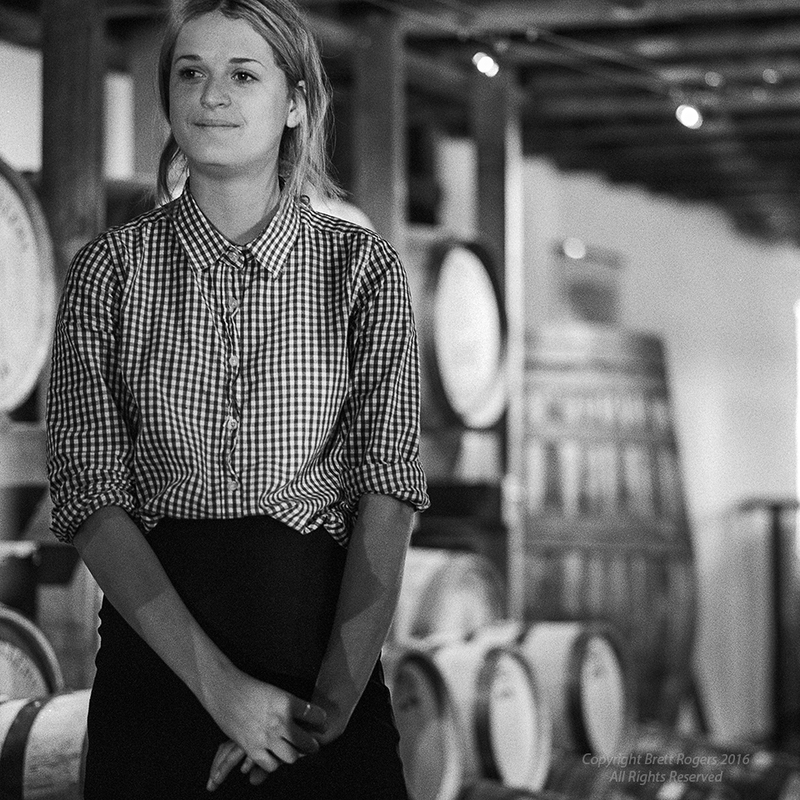 Grace, of Nant Distillery in Bothwell, Tasmania. Camera: Hasselblad 500C/M SLR. Lens: Carl Zeiss 80mm Planar f/2.8 Film: ILFORD Delta 3200 silver halide black & white negative exposed at EI 3200, developed in Kodak HC-110 developer @ 20C. 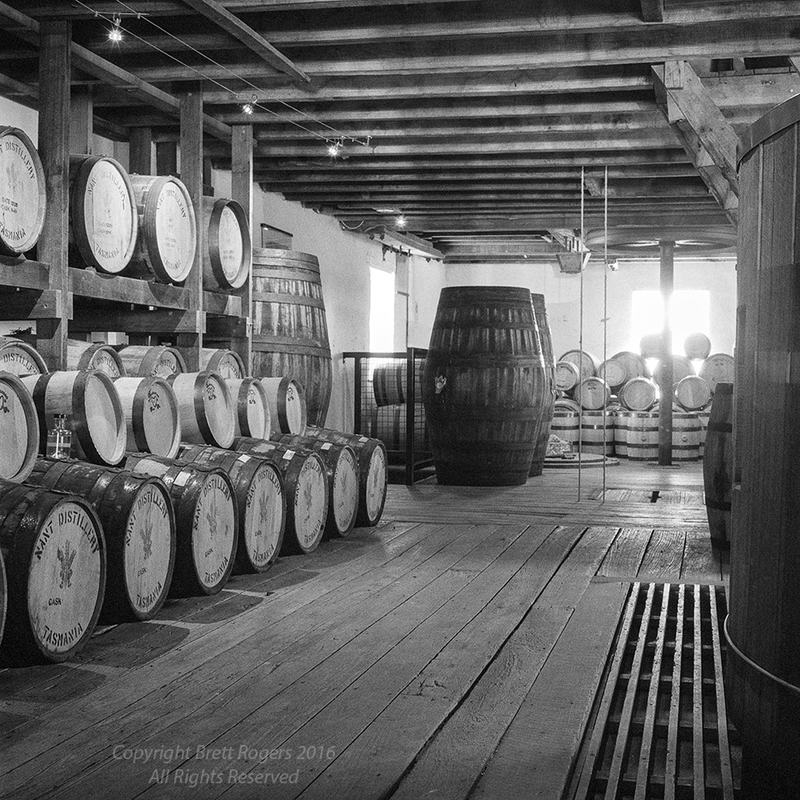 As I’d hoped, the interior of the mill, repurposed as a repository for oak barrels of single malt proved to be ideally suited to a few frames of black and white. By selecting a shutter speed of 1/60 or 1/30, I was (just) able to ensure images made with the Hasselblad hand-held were acceptably sharp. As is usually the case shooting hand-held in lower light conditions I made the most of whatever depth of field was available with the lens open, or nearly so. The Mill, Nant Distillery. Camera: Hasselblad 500C/M. Lens: Carl Zeiss 80mm Planar f/2.8. Film: ILFORD Delta 3200 (details as above). 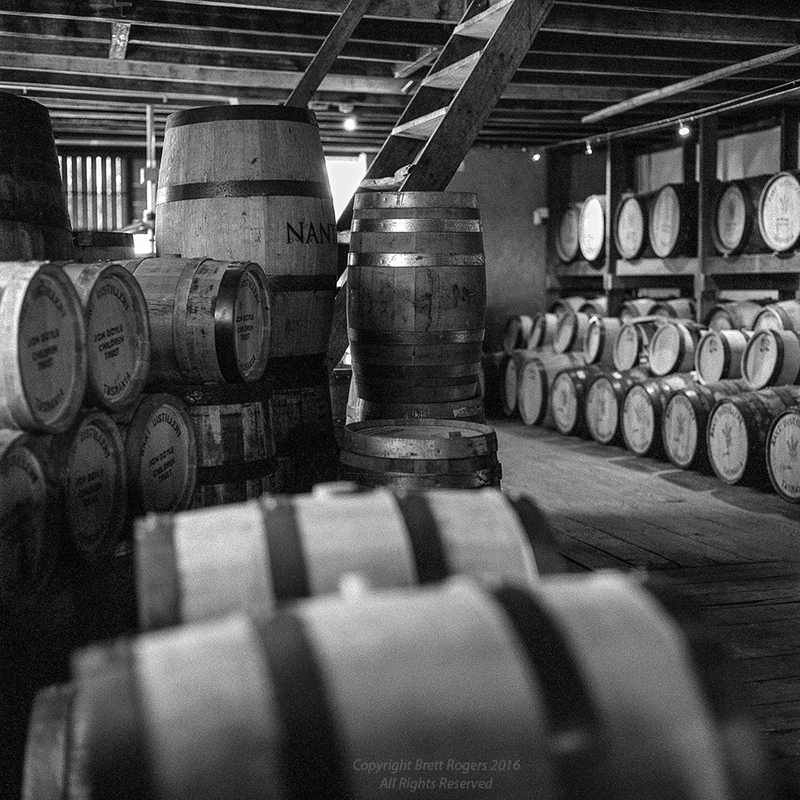 Nant mature their whisky in a range of barrels previously used for maturing red wines such as pinot noir, or those for fortified wines like port or sherry, and also bourbon casks. These all impart their own characteristics into the whisky, and during the after-tour tasting it was interesting to compare the effect that the choice of barrel had on its contents. My own favourite was the Port Cask. Single Malt Casks. Camera: Hasselblad 500C/M. Lens: Carl Zeiss 80mm Planar f/2.8. Film: ILFORD Delta 3200 (details as above). 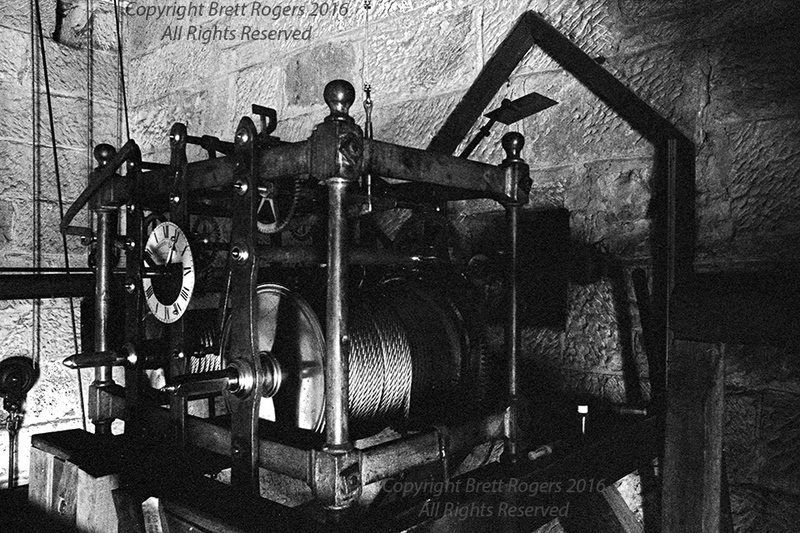 Near the end of the tour I was able, with the aid of a convenient dividing wall, to stabilise my Icarex 35mm SLR sufficiently to use its self timer for a vibration free half second exposure on the roll of slower Fuji Acros 100 black and white loaded in it. Acros is a non-starter for hand-held indoor imaging, however its superb reciprocity characteristics make it an ideal choice for longer exposures, indoors or outdoors—providing a tripod is able to be employed. In front of the window in the far wall, the gear shaft driven by the water wheel has been recorded in action. Mill Interior & Gear Shaft. Camera: Zeiss Ikon Icarex 35CS. Lens: Helios 44 58mm f/2. Film: Fuji Acros 100 (details as above). Text and Images Copyright Brett Rogers 2016. All Rights Reserved.